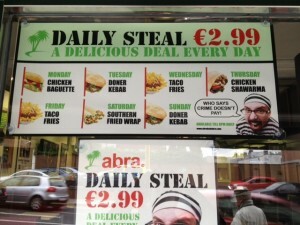 I’d noticed the deals advertised in the Abrakebabra window but I’ve been kind of avoiding trying them out. Silly really but I did have a pretty awful experience following a visit to AK a long time ago and I haven’t been in one since. I had planned to go to Burdocks in Rathmines today. 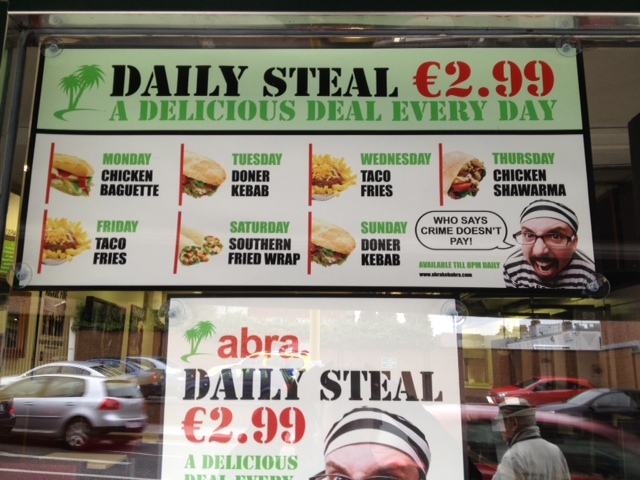 There’d been a sign in its window for months advertising some fishy bites or some such, with chips, for €4.99 but when I got there, the offer was gone. I had biked past AK on the way so I thought I’d take a deep breath and give it a go. Rathmines always feels to me like a bit of a mess. It’s long. Shops come and go with terrific regularity an the Swan Centre doesn’t quite work as a shopping centre. But bits of it are thriving. There’s a lot of buzz near Aldi and Lidl. The stretch near Jo’Burger is interesting and there’s a new antique/bric-a-brac shop there called, I think, The Third Policeman, which I enjoyed browsing in a couple of weeks ago. The new pool/leisure centre is great (and if you need private swimming lessons – which aren’t as expensive as you might think – go to Eva) and you can get a rather pleasant back/shoulder massage in the foyer for €15. 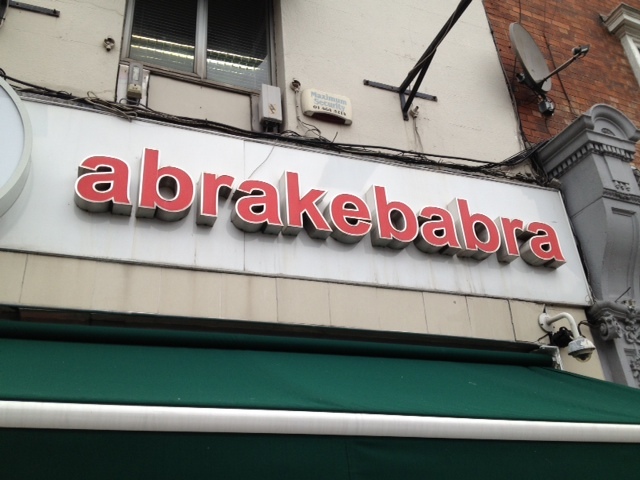 And if you’re looking for oriental/asian/Polish/middle-eastern foodstuffs, Rathmines has them all. I mean. 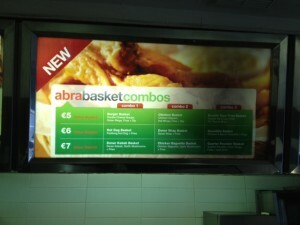 Eat for €2.99? How could I resist? The place has been there for a while and it’s showing signs of wear and tear but it’s spotlessly clean. Really clean. No grease, grime, dust even. It was also empty. It was 1.50pm so, if there was a lunchtime rush, it had gone. 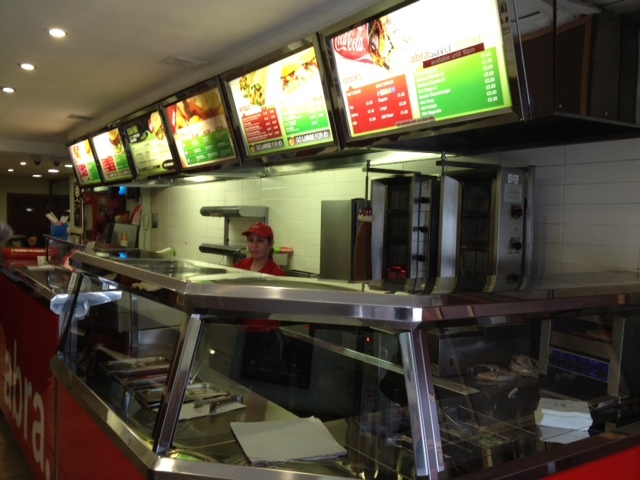 The staff members I talked to were friendly and chatty. 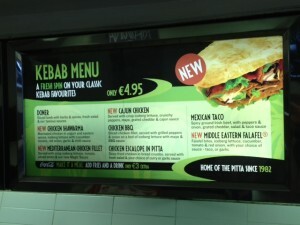 I’ve said it before and it bears repeating – being made to feel welcome in an eatery, however cheap an eatery, makes a huge difference. I ordered the Daily Steal for Friday: Taco Fries. Normally €4.80. Today: €2.99. 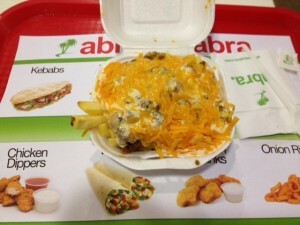 It comprised chips with a big spoonful of spicy mince, some mayonnaise-like sauce and a handful of grated cheese, all loaded into a polystyrene burger container. It’s not that pretty to look at. In my experience, a taco usually involves some sort of tortilla thingy. I dug deep into this thing but I couldn’t find one so I’m not sure why it’s called what it’s called. And the taste? The fries were OK. A little soggy but that was my fault for chatting to the staff for so long. The mince was much as you’d expect really, with a decent lingering chilli sensation on the tongue. The Mayonnaise-like sauce was sweet which I didn’t like at all. Not sugary sweet – but too sweet for my taste. The cheese was grated cheddar. Now, I’m not going to be too critical here. Remember, I spent less than €3 on this food. It was filling. It tasted OK. The surroundings were clean. There was a big TV to look at. The staff were friendly. The place was warm and I was sitting down for a while. Given the gouging that still goes on in Dublin, this was OK. If it was late at night and I’d had a few pints and needed a feed quickly, this would certainly do the job. 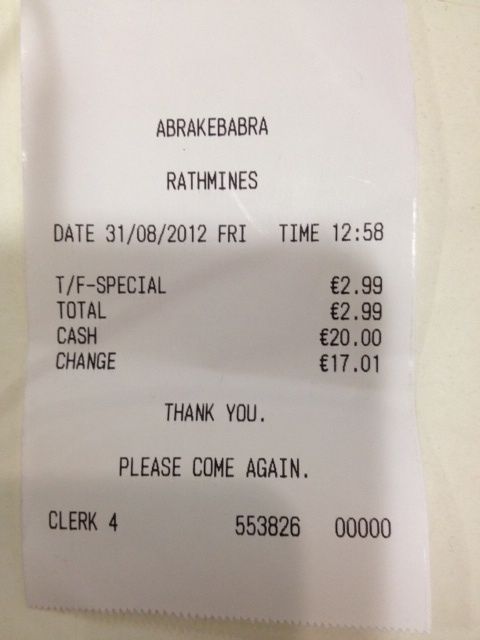 And the receipt. €2.99! You wouldn’t get coffee in some places for that.